Ron Tidrow of Arrowsmith Leather finds the fascinating and sensuous feel of leather affects his creative process. Ron chooses each piece of leather personally. Arrowsmith products are made from cowhide, with textured decorative leather accents. 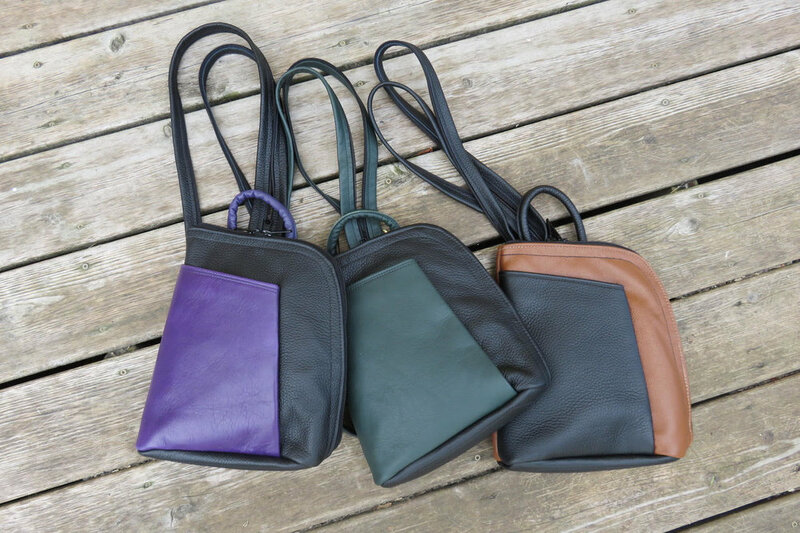 Using a wide variety of thin to thick hides to provide strength, comfort and flexibility in each item, soft leather bags are lined with durable fabric and double stitched during the final assembly process. Ron's style includes asymmetrical designs, negative cutouts, applique, lamination, bold contrasting colours and textures. His design focus emphasizes attention to artistic detail, including relevant decorative trim and stitching to complete each piece. The drive to create original work has been part of my passion and process since becoming a leather artisan. The beauty and colours of nature inspire my recent additions.